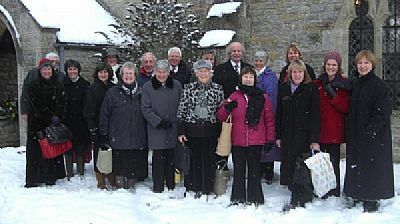 Willoughby Choir after singing at a wintery wedding in Wysall. Willoughby Choir was founded in 1986 and has become a well-established feature of the village and neighbouring Widmerpool and Wysall. We have more than 20 members from the 3Ws villages and further afield. Our repertoire is fairly broad – old and new, religious and secular. The choir is led by Ruffy Garratt and our piano/organ accompanist is Robert Weavell. The choir does not audition for membership and there’s no need to read music, though of course it helps! We sing together because we enjoy singing, so if you enjoy singing then come and join us. All voices (soprano, alto, tenor, bass) will be welcomed. If you want to know more, contact Pru Tatham (01509 880975), Ruffy Garratt (0115 9374443) or Adrian Bath (01509 880830), or just come along to one of our practices on a Sunday evening. We rehearse most Sundays from 7 to about 8.30 pm, in Willoughby Church.